You must be a member of the Doha Changemakers Group to attend this activity. Would you like to join this group? Compassion and kindness has no boundaries. Suffering is universal, regardless of gender, race, specie or religions. On Saturday 19 January, I would like to dedicate this event to helping the dumped cats in Doha get to a brighter better forever future. Qatar's landscape is synonymous with cats. Wherever you go, there are cats. The lucky ones are looked after and healthy. Most are not and are dependant on a handful of volunteer rescue groups for their survival. 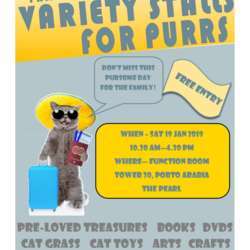 Proceeds from the stalls are dedicated towards helping the Purrs travel to their forever homes abroad. With the number of dumped cats looking for homes far outweighs the number of credible homes available locally, the opportunity to travel abroad to countries such as the US and the UK is the only viable hope for many of these cats. 2. Bake a cake or cook up your family secret recipes for us to sell! We have homemade chinese dumplings, spring rolls and banana cakes on offer! 3. Donate a bag of cat food to our Feed the Purrs Stalls! 4. Be a volunteer on the day! Help us set up or tend to the stalls. 5. Are you good with kids? Help us with the kids' activities! Please get in touch by Thursday evening, 17 January if you are able to help with any of the above! If none of that floats your boat, how about just spreading the words, bring your friends and families and join us for the day.